Thank you for joining us at AI Forum 2018! To watch the highlights video and read some of the key learnings from our 2018 event, click here. 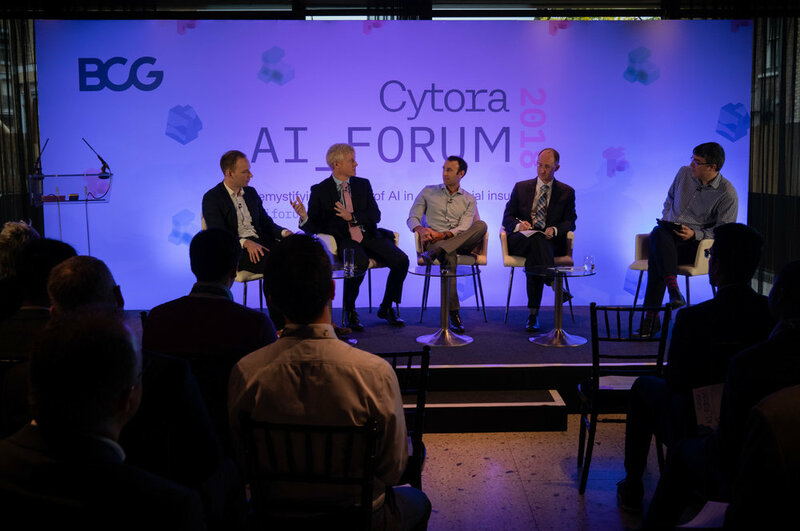 AI_Forum strips away the hype to discuss the specific applications of artificial intelligence, including changes to the economics of underwriting, realisable benefits to the combined operating ratio, and emerging shifts in the insurance value chain. See some of the highlights from AI Forum 2018! Siraj is a Partner on the investment team at Atomico. As a former computer scientist and co-founder/CTO of the successful Atomico investment The Climate Corporation, Siraj now continues his love for entrepreneurship "on the other side of the table" as a venture capitalist. He focuses on companies enabled by machine learning, AI and computer vision, (particularly in intelligent assistants), IoT, Agtech, and works with a number of portfolio companies. Richard Hartley is CEO and Co-founder of Cytora, the technology company powering a new way for the insurance industry to price risk. The Cytora Risk Engine uses artificial intelligence to learn the patterns of good and bad risks over time, enabling insurers to price risk more accurately while delivering fair and frictionless prices to their customers. Prior to Cytora, Richard worked in product strategy at eBaoTech Shanghai, a cloud technology vendor to the insurance industry. Claire is Managing Partner at Decoded. Helping businesses transform, through world-class technology and innovation education programmes. Working in partnership with leadership to help their organisations thrive, adapt and enable growth in an ever-changing world. Rob joined Balderton Capital in 2009 and was promoted to partner in 2015. Companies he works with at Balderton include Carwow, Cleo, Wooga, Zego, Dinghy, Mojiworks and Patients Know Best. Rob's focus sectors are fintech, insurance and blockchain. Paolo joined BCG in 2017 after eight years in the Lloyd's of London market working for established companies and insurance start-ups. At BCG Paolo works with carriers, brokers, insurance associations and technology companies developing and implementing growth strategies. Paolo is a leading member of the global insurtech movement and in 2015 co-founded InsTech London, the world's largest insurtech association. Richard Coleman is European Director at Collinson, and is responsible for building and executing the strategy across the Group’s capabilities in Europe. Previously, Richard was Managing Director of Zurich’s UK Commercial Broker business, and has broad experience across a range of insurance functions including large-scale technology and people transformations. Sam White is Founder and CEO of Pukka Insure, Freedom Services Group and insurance services provider Action365, and recently launched motor brokerage, Freedom Brokers. Sam runs several successful insurance businesses employing over 200 people with a turnover in excess of £15 million. Matthew spent over 20 years driving the growth in the use of catastrophe models worldwide. Today he works with the CEOs and executive teams of many of the best known, and fastest growing data and analytics companies servicing the insurance market. He provides strategic support for market definition, sales, marketing communication and investment. Matthew is the founder of Abernite and a partner with Instech London, one of the leading Insurtech communities in Europe. David McMillan joined QBE in September 2017 as Group Chief Operations Officer and is based in the company's London office. Prior to joining QBE, David was the CEO Europe and India and Chairman of Global Health Insurance for Aviva plc. Earlier in his career at Aviva, David was CEO of UK General Insurance. David joined Aviva in 2002 following almost ten years with the management consulting arm of PricewaterhouseCoopers. Alan is the Chairman of MMC Ventures and co-founded the business in 2000. 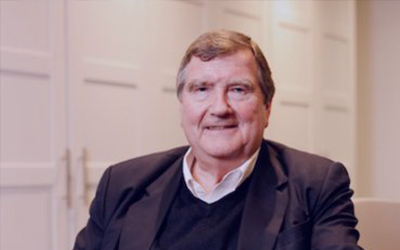 Alan chairs AdFisco, an advisory company focused on financial services, and is a Non-Executive Director of a number of companies including Future Route, Funding Options and Obillex. Previously, Alan spent 28 years at McKinsey & Co where he was head of the financial services practice in UK, Europe and the Middle East. He was also a board member of the McKinsey investment office which manages about $8 billion of staff and partner retirement and investment products. What can insurance learn from analogous industries who are using AI to understand risk? We’ll explore how industries analogous to insurance are using artificial intelligence to underwrite, ranging from credit to climate risk. Learn what the decisive factors are that determine how quickly underwriting will shift from being manual and human-driven to programmatic. Insurance leaders are beginning to acknowledge digital transformation as the paradigm shift that it is. Like any major transformation, it requires instilling a culture that supports the change while enabling the company’s overarching strategy. In this session, we examine the crucial aspects of building a successful digital culture. How will AI change the structure and composition of the insurance value chain? Hear predictions about how the insurance value chain will change as key parts of an insurance company become commoditised and deployable via API. Will the current structure persist or can we expect major shifts in the interplay of distribution partners, the primary layer, reinsurers, and third-party capital? Let’s talk specifics on how artificial intelligence is being used to price risk. What is working today vs what is out on the frontier? We’ll examine the concrete economic benefits of AI-powered underwriting, focusing on frontline underwriting expenses and loss ratio. Learn how AI can be practically implemented into underwriting workflows to transform the insurance buying experience for SME customers. We'll discuss how the benefits are distributed across the submission to quote process and are broken down across submission prioritisation, risk selection, pricing adequacy, and operational efficiency. Nobu Hotel is a modern, informal venue, positioned between the energy of East London’s cultural district and the economic centre of the City.